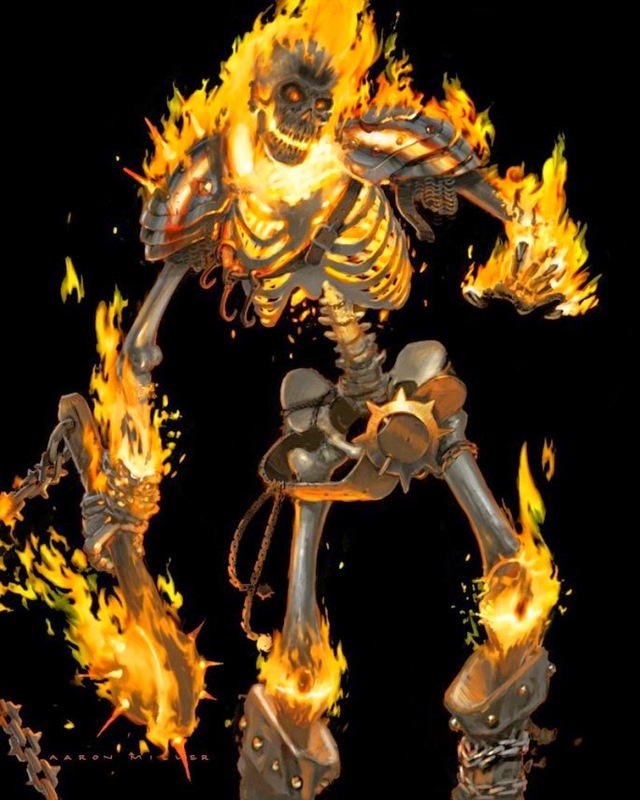 The Burning Dead are skeletons whos bones are burning constantly. Anyone touching the aura or within close combat will take damage. This includes weapons striking the Burning Dead. If that wasn’t bad enough once the Burning Dead reach 0 HP they will explode causing burning damage and hot bone fragments. One vulnerability is they can not be equipped with any armor as it interferes with their exploding ability when they die. Another vulnerability is water which causes considerable damage. Weapons they use must not contain combustible items and as such most weapons are steel or iron with nothing special on the grips and are usually heavily damaged from the constant heat. Soft metals should not be used either. They have a considerable resistance to heat and fire which allows them to be placed in groups without damaging each other. Explodes on Death: Innate Attack: 2D-3 burn (Incendiary +10%, Explosion: 1 +50%, Fragmentation (Hot Fragments) +15%; Trigger: Common (on death) -20%) . Those caught within 2 yards will take 2d-3 Burn damage in the same hex, 2d-3/3 for 1 hex away, and 2d-3/6 points of damage 2 yards away. Fragmentation Hot Fragments: Cyclic (Six 10-second cycles) is 5 yards and taking 1d(0.2) burn damage if hit. This entry was posted in Monsters, Template and tagged Bestiary, GURPS, Monster, RPG, Template, Undead by Highland_Piper. Bookmark the permalink.